Recently, (at least) three things converged unexpectedly to generate what looks to be a new poetry manuscript: some recent personal turmoil resulting in Loss, Marc Gaba's inaugural poetry collection HAVE that made me reconsider poetic line and (or, versus) the prose poem paragraph, and a weariness with the message-ridden form of poems I'd been writing as I explored the subject of orphans. I was delighted, by the way, to see Tupelo Press publish Marc Gaba's HAVE. I'd been aware of this poet's writings and am pleased to see him get attention for his, among other things, tensile minimalism. In HAVE, the attention to the poetic line is so evident that reading through this collection was the final impetus – there were earlier ones which I never acted on until now – to create poems by annotating Reproductions of the Empty Flagpole. This was my first U.S. book which, by being all prose poems, had always contained (I thought) wonderful phrases that could be recontextualized into new poems if they were chipped out, a la sculpting, out of their prose blocks. Annotation is not, of course, a new poetic technique though I again stress that I wasn't focused so much on textual inspiration as pretending to be Michelangelo. 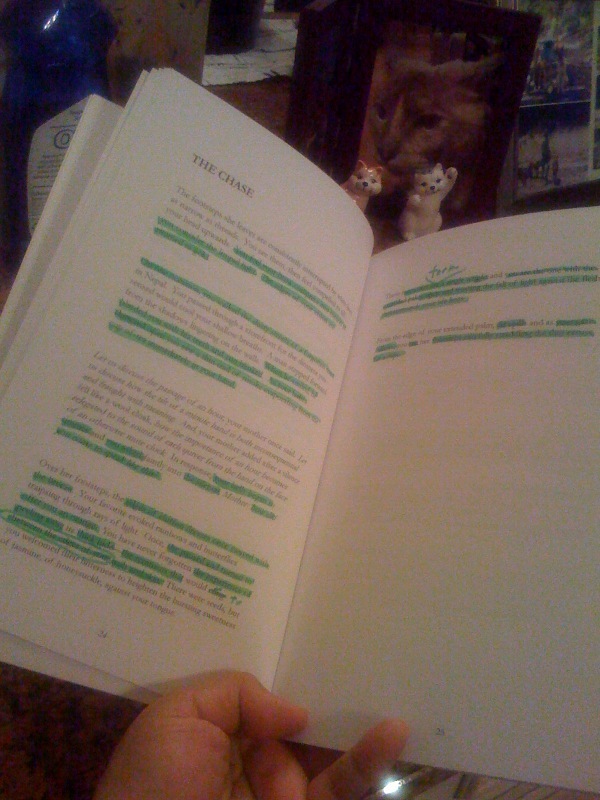 To illustrate, here's a photo of my poem "The Chase" from the book--the green highlights depict phrases that I used as raw material for a new poem entitled "(The Chase". The difference in the title is the insertion of an open parenthesis mark without the close parenthesis, signifying the poem's open-endedness. Emptiness here is partly the opposite of message-bearing. I had nothing in mind to say when I sculpted these new poems -- I was simply relying on what was already written in Reproductions of the Empty Flagpole. The emptiness also relates to Loss; and I just realized that this new manuscript actually bears the opposite sensibility to what underpinned Reproductions of the Empty Flagpole, which was Desire. Without going into details, my recent personal loss certainly was the negation of Desire. Anyway, you can compare the six prose paragraphs in the original poem "The Chase" with newly-sculpted poem "(The Chase" comprised of 18 thin stanzas which has just been published in that fabulous poetic space curated by Halvard Johnson, On Barcelona. It's in great company -- do check out the other poems (I most recently enjoyed Ric Carfagna's!). Not only do my two poems look different but they really are different in content, as different as Loss vs. Desire.